Great service!! Really appreciate the team and will recommend this site to many more. 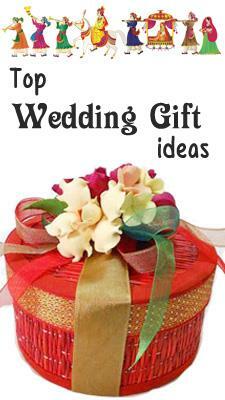 I am very happy with your service,as we are able be delivery our wishes to our dear ones on their special day. My mothers happiness on her bday with your service made me very speachless. Also the new USD service is also appreciable. Thank u for delivering flowers and cake on my sister s wedding way back in Hyderabad. They felt very happy in receiving them. Thanks for your service. 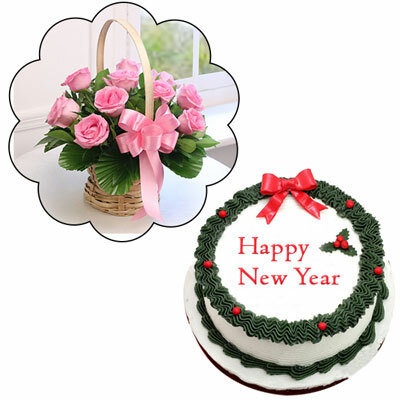 Yummy delicious round shape vanilla flavor cake - 1kg + 12 pink roses flower basket with decorative ribbon attached. Yummy delicious round shape dark chocolate cake - 1kg + Hibiscus Plant (Pink) NOTE: Same day Delivery for Hyderabad and Secunderabad. For other places requires minimum 2 to 3 WORKING DAYS. Yummy delicious heart shape straw berry cake - 1kg + Money plant with pot NOTE: Same day Delivery for Hyderabad and Secunderabad. For other places requires minimum 2 to 3 WORKING DAYS. Yummy delicious heart shape chocolate flavor cake - 1kg + Tulasi plant with pot NOTE: Same day Delivery for Hyderabad and Secunderabad. For other places requires minimum 2 to 3 WORKING DAYS. 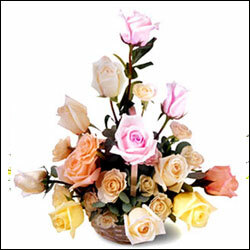 Floral Design Round shape Vanilla Cake - 3kgs + 12 mixed roses flower basket with fillers decorated with ribbon attached. 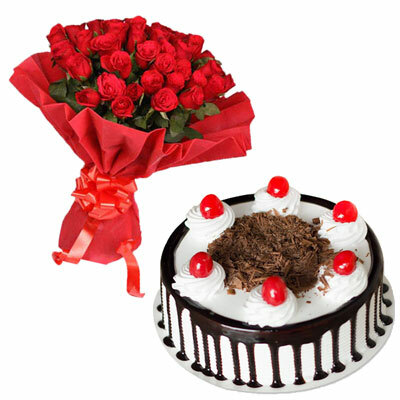 Beautiful 25 red roses flower bunch with red color decorative paper wrapping along with bow +Yummy round shape chocolate cake - 1kg. Yummy delicious Fresh Fruits Round shape Pineapple cake - 3kgs + 12 mixed roses flower basket with fillers decorated with ribbon attached. Delicious round shape black forest cake - 1kg + 12 mixed roses flower basket with fillers decorated with ribbon attached. Round shape butterscotch cake -1kg + Fresh and beautiful flower arrangement with 20 red roses and fillers. Special Heart shape cake - 1.5kgs + Fresh and beautiful flower arrangement with 20 red roses and fillers. Yummy Delicious round shape Snow man cake ( wt.3 kgs ) + Beautiful Flower Arrangement with Pink Carnation 11, Red Roses 10, White Glades 2 no along with fillers. 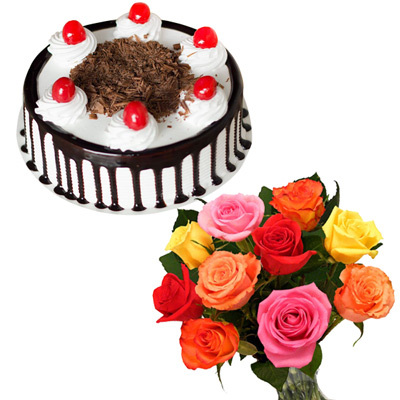 1kg round shape cake (vanilla flavour only) + 12 pink roses flower bunch is a perfect gift combination on this special eve. 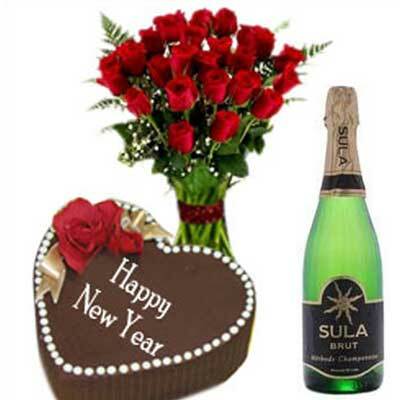 Convey your dear one by gifting this cute hamper consist of 100 red roses heart shape flower arrangement + 1.5kg heart shape cake to say how much you miss them. 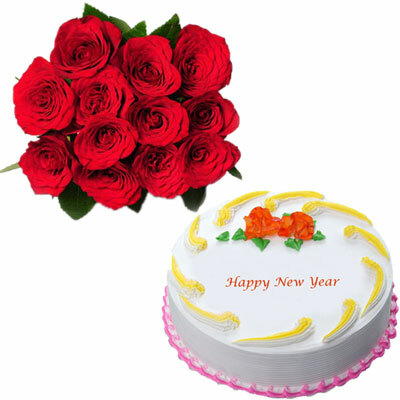 1.5 kg cake ( strawberry flavour )+ 20 Red roses flat bouquet with seasonal fillers goes well on this eve to express your heartly wishes to your dear one. 12 Red Gerebras in a vase +1.5 kg yummy delicious cake is just enough to say the precious greetings to your beloveds. Us2guntur.com - India, Plot No:124, ARK Chambers, Kavuri Hills Phase 1, Jubilee Hills, Hyderabad - 500033, Telangana, India. 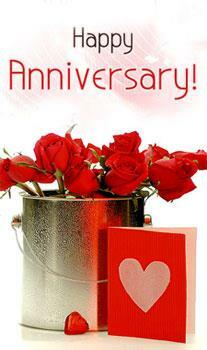 Us2ap.com / Us2guntur.com is an E-commerce Gift portal which deals with online Gifting feature. Carry the feelings to their Dear one's through Gifts. No.1. 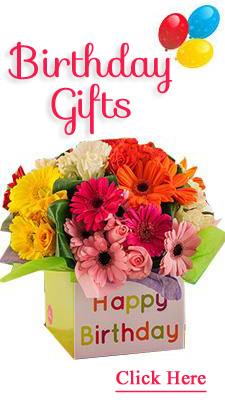 Gift Portal in India, Holding of 2 Million+ satisfied Customers. Main features are Photo of Recipient at the time of Delivery, More than 250+ Product categories with 1Lakhs products , Creative Gifting ideas like Video Surprises, Never Ending Surprises, Hidden Surprises etc., Prompt Deliveries , 24x7 Customer Care Help- Live Help. Midnight services, same day orders- subject to acceptance. 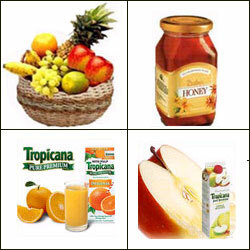 You can send Creative gifts to Dear ones, family members, friends etc through our group portal like www.us2ap.com, www.us2chennai.com, www.us2bangalore.com, www.us2kolkata.com, www.us2pune.com, www.us2delhi.com. 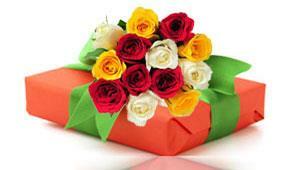 You can send gifts to your dear one at any point of time, send gifts to surprise them during midnight surprise gifts. Us2AP.com is the one and only one gift portal with four branches at Hyderabad to serve faster. Dilsukhnagar, Hyderabad, Secunderabad and Ameerpet are the main zoal areas to serve Hyderabadis and twin city Customers. Highlights of Us2guntur.com/Us2ap.com- Own Delivery Team, Quality Products, Quality Services, Free Digital Photo, Free Shipping Charges, Best Prices with Good Customer Service Support. 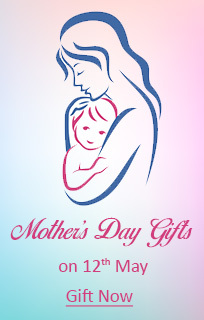 There are wide range of gifts for any relation like Gifts 4 Mother, Gifts 4 Father, Gifts 4 Brother, Gifts 4 Sister, Gifts 4 Him, Gifts 4 Wife / Fiancee , Gifts 4 Bride, Gifts 4 Bridegroom, etc. Us2guntur is the right choice to select for sending gifts on occasions like Birthday Gifts, Anniversary Gifts, Valentine's Gifts, New Year Gifts, Christmas Gifts, Friendship Day Gifts, Mother's Day Gifts, Father's Day Gifts, Rakhi Gifts, Retirement Gifts, Wedding Gifts, and on Indian Festivals like Rakhi Gifts, Diwali Gifts, Dussehra Gifts, Ramadan Gifts, Pongal Gifts, Ganesh Chaturthi Gifts, Ugadi Gifts, Ramzan Gifts, etc. 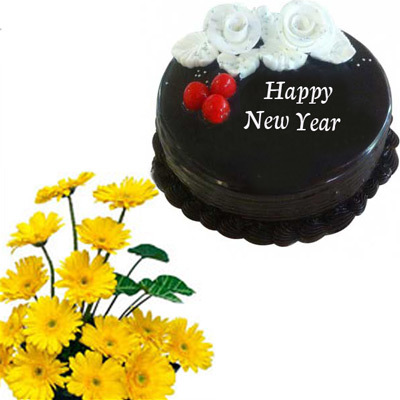 Flowers and Cakes are the first choice of every Customer to celebrate any occasion. We deliver fresh with Fragrance Flowers bouquets, Flower bunches, Flower baskets, Life size bouquets, Life size arrangements, Heart shape flower arrangements, Valentine Roses, Special Roses for Valentine's Day, Wedding Garlands, throughout A.P. 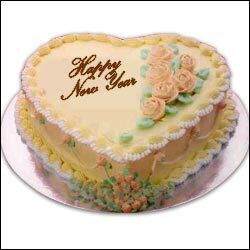 Yummy Sweet Tempting Cakes like plum cakes, New year Cakes, Cakes for New Year celebrations, Christmas Cakes, Photo Cakes, Butterscotch Cakes, Strawberry Cakes, Chocolate Cakes, Black Forest Cakes, Pista Cakes, Grand cakes, Step Cakes, Cartoon Cakes, Cakes 4 Kids, Heart Shape Cakes, Funny Cakes, Personalised Cakes, ITC Kakatiya Cakes, Taj Cakes, Wedding Cakes, Birthday Cakes, Retirement Cakes, which suits taste of every aged group People to send Flowers to India, Cakes to India, Wedding gifts to India, New year Gifts to India, etc. 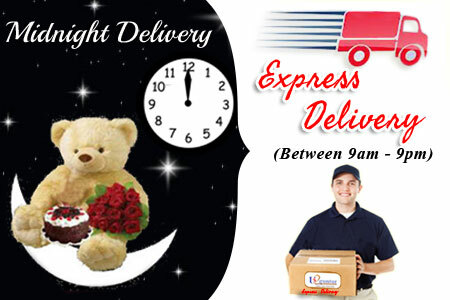 Gifts To Hyderabad, Cakes To Hyderabad & Flowers To Hyderabad Free Home Delivery Same Day, Midnight services Gifts 2 India, gifts india, gifts to India, gifts hyderabad, gifts2hyderabad, gifts 2 hyderabad, birthday gifts to hyderabad, birthday gifts 2 hyderabad, wedding gifts 2 hyderabad, wedding gifts wedding gifts to hyderabad, flowers hyderabad, Flowers 2 hyderabad, cakes to hyderabad, hyderabad cakes, flowers to hyderabad, send gifts to hyderabad, send gifts 2 hyderabad, anniversary gifts to hyderabad, rakhi gifts to hyderabad, mother's day gifts to hyderabad, valentine's day gifts to hyderabad, new year gifts 2 hyderabad, new year gifts, new year gifts to hyderabad, Christmas gifts, Christmas gifts to hyderabad, Christmas gifts 2 Hyderabad, X-mas gifts to hyderabad, X-mas gifts 2 hyderabad, gifts, gift, hyderabad, gifts to india, gifts for her, gifts for him, gifts for kids, Valentine's Day Gifts To Hyderabad, Hyderabad Gifts To Secunderabad. gifts 4 Kids , Gifts 4 him, gifts 4 her, gifts 4 Dad, Gifts 4 Father, gifts 4 mother, gifts4mom, gifts 4 brother, gifts 4 sister, gifts 4 fiancee /Wife, gifts 4 wife, gifts for fiancee.